Happy (Scary) Halloween! 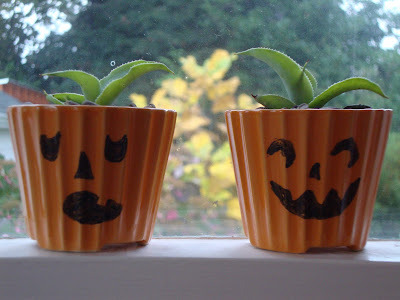 I potted up 5 tiny agaves that I brought back from California in these little orange pots, and had them setting in the window. Andrew thought they looked like pumpkins. So he added the jack-o-lantern faces (don't worry it's a dry erase pen so they'll come off). Since I am pathetically out of tune with the calendar I hadn't even managed to buy a pumpkin yet. These will do nicely. 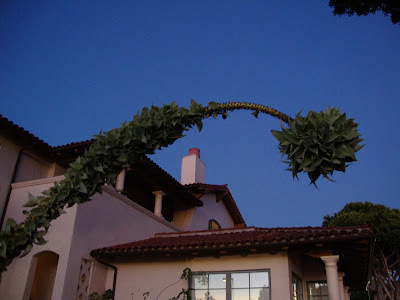 The agaves came from this bloom on the mother plant in Santa Barbara...cool huh? Enjoy the holiday and don't eat all the candy at once! Very cute and cool! And perfectly in tune with the danger garden. 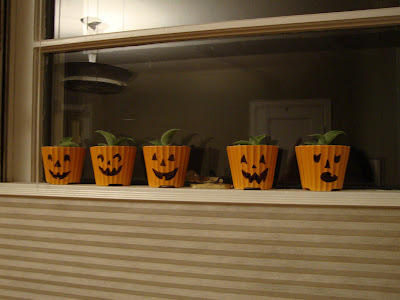 Don't feel bad about not getting a pumpkin: if we hadn't had a pumpkin volunteer plant, I wouldn't have had any for my front porch either. Andrew is so crafty! He should get his own TV show, and magazine just like Martha Stewart! Except, let's not let him go to jail like she did!! wow, i don't think I've ever seen the mother plants have sprouts off of the old bloom like this before. Usually the new starts are just growing along side the main plant. This is gorgeous! Awesome agave bloom! I bet that could do some serious damage if it fell over.